An artist who never quite became a star but was notable for being on the perhiphery of rock’s fateful evolution over its first decade in more ways than one. Joe Lutcher was born in Louisiana in 1919, four years after sister his Nellie who became the bigger star in the family. The two got their start singing in church and while Nellie learned piano, Joe played saxophone and both became professional musicians early on with Nellie moving to Los Angeles where she became a solid club performer. 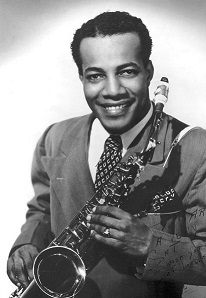 After serving in World War Two younger brother Joe settled in Los Angeles as well and played behind Nat “King” Cole and The Mills Brothers. In 1947 both siblings scored recording contracts, Nellie with Capitol Records where she hit immediately with a string of slinky suggestive songs positioned mid-way between jazz and pop with hints of uptown blues. She notched seven Top Ten hits in her first year, one even crossing over to the Pop Charts, but after her sizzling start she landed only a handful of hits after that and just one more Top Ten and that was a duet with family friend Nat Cole in 1950. As for Joe he signed with independent label Specialty which would seem to indicate he’d be allowed to record in the style he preferred, namely the burgeoning rock scene. Yet company president Art Rupe wanted him to avoid that low-brow type of music and aim for higher artistic standards. The two never saw eye to eye, though Lutcher did cut some sides that pointed to the future including the presciently titled “Rockin’ Boogie” in the spring of 1947. Upon his sister first success that summer Nellie persuaded Joe to jump to Capitol with her and there he was able to pursue his own muse, scoring a hit right out of the gate with an early rock instrumental. Ironically the Specialty recorded “Rockin’ Boogie” was re-released to capitalize on it and it too became a belated hit, validating his early instincts in moving towards that emerging field. Yet for all of his enthusiasm at its possibilities, Lutcher’s style was still beholden to older musical standards to a degree and so he was never at the forefront of rock as it progressed and in fact was often well behind the curve stylistically, but his ideas themselves were fairly solid. He remained a reliable performer with some good records scattered amongst his releases yet never was able to really break through as his sister had. In the mid-1950’s he became a devout and outspoken Seventh Day Adventist and quit music, yet his ties to the music world ended up having a far-reaching impact when in 1957 he was discussing religion with Little Richard, then at the height of his popularity, and it was Lutcher who convinced Richard to give up rock ‘n’ roll and enroll in Bible College and become a minister. Though there may have been other motives behind this move – royalties that Richard felt he wasn’t being paid – the irony (or was it karma) was that Richard was the star of none other than Art Rupe’s Specialty Records label, the same Rupe who’d resisted Lutcher’s urge to rock a decade earlier, perhaps denying Lutcher the role of instigating rock ‘n’ roll’s rise to glory. Lutcher later ran a gospel label and refused all requests to discuss his more colorful past musical life. Both he and Nellie survived well into the 21st century, she making it to 94 years of age in 2007 and Joe passing away a year earlier at 86.